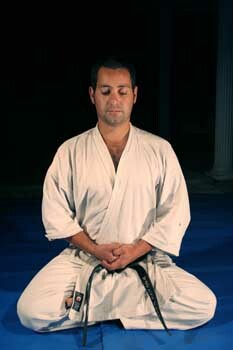 Zazen is also a very good complement to the practice of karate-do; it is the practice of “zen” in a sitting position. The objective is to harmonise our mind, body and breathing so that they work together in a unit. Under an ideal point of view it should be performed in a sitting position, in a “lotus” or “half lotus” position. The back should remain straight, the chin slightly contracted and the eyes almost closed (reduced vision). When our posture is perfectly adjusted we concentrate our energy in the intake and out take of air while breathing. The objective is to harmonize body and mind through deep breathing. During the intake of air, we absorb vital force and energy. When we exhale, we project power and wisdom. At the beginning we must try to breath with the “tanden” (lower part of our body surrounding its centre of gravity). Gradually and unconsciously, our breathing frequency will decrease. During inhalation and exhalation, the practitioner will gradually concentrate on the flowing of his energy rather than on its point of origin (“tanden”). This spiritual force and vital energy will finally flow through the whole body. The ultimate end is the achievement of “mu”: all the mental and physical energy is driven through unconscious breathing towards the “tanden”. Our own being is transformed into flowing energy: it all comes from “ku”, from ”nothing”, from “total emptiness”. When comparing the essence of the Art of Karate-do with Zazen, both arts are practically identical. 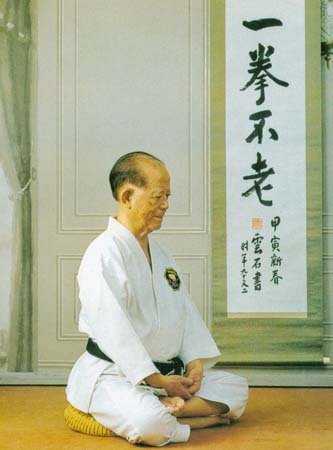 This is the reason why O´Sensei Shoshin Nagamine gave such importance to the practice of Zazen as a complement to enrich the Art of Karate-do.